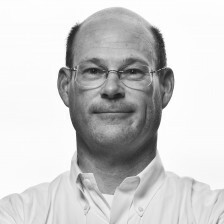 This past week, an excellent article by Charles Wallace, entitled “What’s Your Heart-Rate Variability? It May Be Time to Find Out,” was published in the Wall Street Journal. My good friend, exercise physiologist and coach, Alan Couzens, contributed on the practical aspects of using heart rate variability (HRV) in the training of endurance athletes generally, and his coached athlete, Inaki de la Parra, specifically. Since then, several readers inquired about previous columns I’d written for Endurance Corner on the topic of heart rate variability, noting that links at my blog to those columns were no longer working. My apologies! I’d need my own IT person to keep track of the many old links. 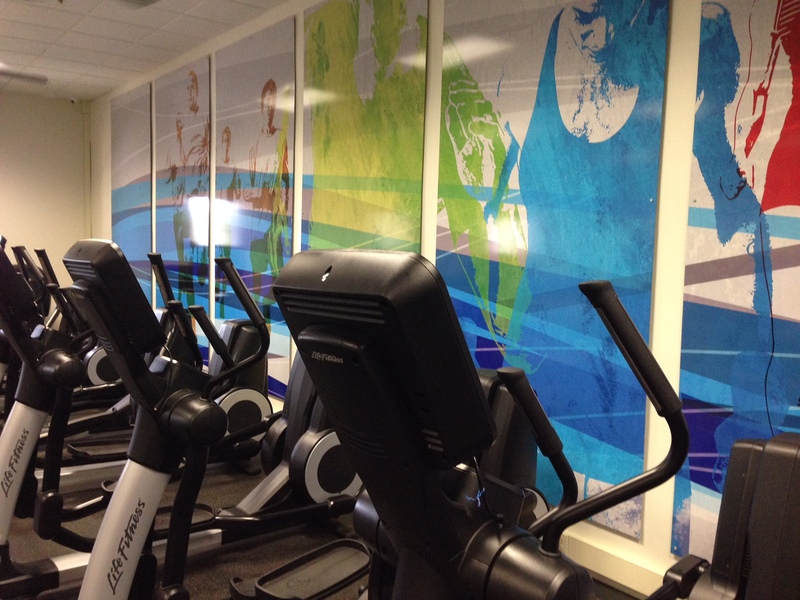 Here’s part 2 of the original Endurance Corner columns…. In previous columns I wrote about resting heart rate and heart rate recovery and more recently about the basics of heart rate variability (HRV), where we developed some basic definitions and terminology. Today’s column looks specifically at the use of HRV in endurance training. We’ll talk about how and when to measure HRV; how HRV might be used to help guide your training; and about some of the hardware and software tools that are available to help you make use of HRV. HRV can be measured at any time of day, over any length of time, and with any desired relationship to exercise. For endurance athletes, we might consider measurements of 3 sorts: “resting,” “during exercise,” or “post exercise.” And keep in mind that we’re measuring HRV as our window into the body’s autonomic nervous system, with its parasympathetic and sympathetic components, hoping this can somehow be related to training. One important consideration is the circadian pattern of HRV. HF and rMSSD are highest in the early morning, decrease throughout the daytime, to an afternoon low, then increase until the following morning. In contrast, LF/HF follows the opposite pattern, peaking in the afternoon. This circadian pattern has implications with regard to how and when HRV should be measured. In order to eliminate the influence of this circadian effect—and to focus more solely on the influence of the autonomic nervous system—daily (or weekly, etc.) measurements ought to be made at the same time of day. The most commonly used—and best understood—measurement is the resting HRV. The ideal time for measurement is just after waking, while still supine. 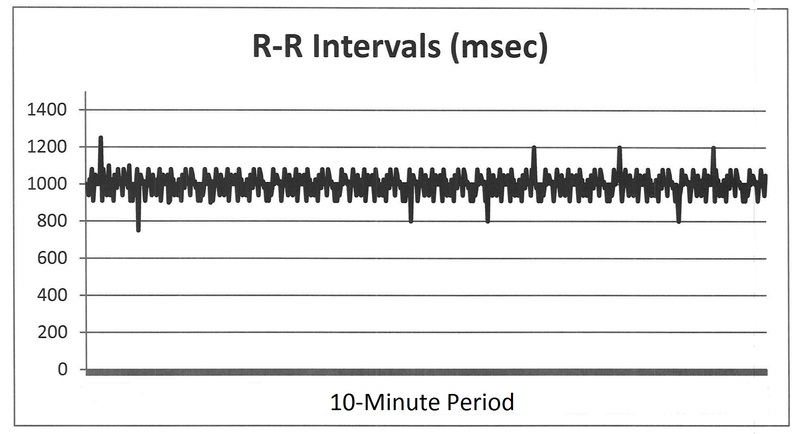 A recording of the EKG to gather R-R interval measurements is made for just a few minutes. The resting HRV can also be measured in the sitting or standing positions, but there is more variability, or noise, in these measurements. Whichever choice is made for body position should probably be used for all subsequent measurements. The use of exercise HRV is limited because the instantaneous HRV is very much related to the intensity of exercise during the measurement. The use of post-exercise HRV is limited because these measurements tend to be influenced greatly by post-exercise blood pressure regulation that, again, is dependent upon the intensity of exercise preceding the measurement. It appears that exercise and post-exercise HRV indices might well be correlated to fitness level, but difficulties with establishing constant conditions during their measurement will limit their utility for most athletes and coaches. Another important consideration is variability from measurement to measurement. The day-to-day variation in the time domain indices (eg, rMSSD) is much less than for the frequency domain indices (eg, LF/HF). As an example, the coefficient of variation for rMSSD may be as high about 10-12%. As a result, some authorities advocate using a rolling several-day average for rMSSD, rather than simply a single-day measurement. Finally, it is important from a statistical standpoint, to have some idea about the smallest meaningful change for any of the indices. Again as just one example, the smallest meaningful change for rMSSD may be around 3%. In the endurance sports, the use of HRV has been studied in 2 general settings—the short term and the longer term. In the short term. On any given training day, intense exercise will lead to a decrease in HRV and this effect can persist for 24-48 hours or so. Based on this observation, some have suggested that intense training only take place again once the HRV has returned to its baseline. Indeed, there is some evidence that training guided by this strategy might result in better performance gains over some period of time. When using this strategy, though, it’s important to remember that factors other than the ANS (eg, sleep, hydration, environmental conditions) also play a role in the HRV and these factors should be kept in mind when interpreting the results. Some of the commercially available HRV devices are designed specifically for this application. In the longer term. For many endurance athletes, training comes in cycles. There are block periods of trainings followed by some sort of rest. At the end of some blocks might come tapering before an event. The use of HRV to help guide training in these various phases of training is not yet particularly well understood. I can share some generalities, though. Thinking about a cycle of training for moderately trained, recreational endurance athletes, moderate intensity training leads to increases in aerobic fitness and a corresponding increase in HRV. Over that cycle, we would also expect a gain in fitness or performance, a decrease in the resting heart rate, and an increase in the rate of heart rate recovery after exercise. For that same group of athletes, a taper, or reduction in training load might ordinarily lead to a subsequent increase in HRV. Here’s the rub, though. In elite athletes and recreational athletes with long training histories, these typical changes have been less consistent. It turns out that HRV responses to training are not only specific to an individual but also to both the recent and remote training history. The most important observation is that the relationship between HRV and fitness is simply different in well-trained athletes: there can be increases in HRV with no corresponding increase in fitness over a training cycle and there can also be decreases in HRV despite increases in fitness. A variety of hardware and software tools are available for athletes and coaches who are interested in using HRV to help guide their training plans. Omegawave. In triathlon circles, Omegawave is probably the most familiar name in HRV technology. Their system for individual athletes includes a heart rate monitor/chest strap that communicates by Bluetooth with a subscription-based mobile software app. The device is used to make a 2-minute recording of the resting HRV. Then, using proprietary algorithms (invisible to the user), the software calculates an index of Cardiac Readiness along with Cardiac Readiness Elements that include “stress,” “recovery pattern,” and “adaptation reserves.” The software also generates a table of appropriate training zones based on heart rate and an index of aerobic readiness. Omegawave touts the utility of their system in helping athletes determine their “readiness to train.” I’ve used the Omegawave system and found it very easy to use. The down side, of course, is that it’s a bit of a black box. Athletes just don’t know exactly what’s being measured or reported. BioForce HRV. Like the Omegawave system, the BioForce system includes a mobile app together with web-based software that are designed to work with a hear rate monitor (eg, Polar). An index of HRV, again not explicitly defined, can be measured during a 3-minute rest period and stored for comparison with succeeding days. 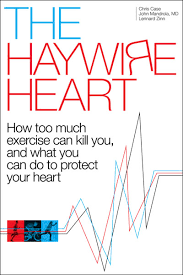 Included with the system is a book, “The Ultimate Guide to HRV Training,” where training recommendations are based primarily on the day-to-day changes in HRV. Like the Omegawave system, the user is blinded to what exactly is being calculated or derived for the HRV index. Ithlete. Another similar product is the ithlete HRV system which uses a proprietary heart rate monitor or finger probe, together with a mobile app, to calculate an index of HRV. ithlete offers the advice that a large drop in HRV from one day to the next should prompt the athlete to back off from training. Like the Omegawave and BioForce systems, the user is blinded to what exactly is being calculated. Heart Rate Monitors. Some heart rate monitors (eg, Polar, Suunto) include a feature that allows for data collection and reporting on R-R intervals that serve as the basis for any HRV calculations. Kubios HRV software. Made available for free download by the Biosignal Analysis and Medical Imaging Group at the University of Finland, and intended originally for use by scientific investigators, Kubios HRV software allows for calculation of the most common time and frequency domain measures of HRV. Inputs can come from an ASCII file of R-R interval data or from some standard heart rate monitor data files (eg, Polar, Suunto). This software is probably the best (and cheapest) tool for athletes who might want to derive particular measures of HRV and relate them to their training. 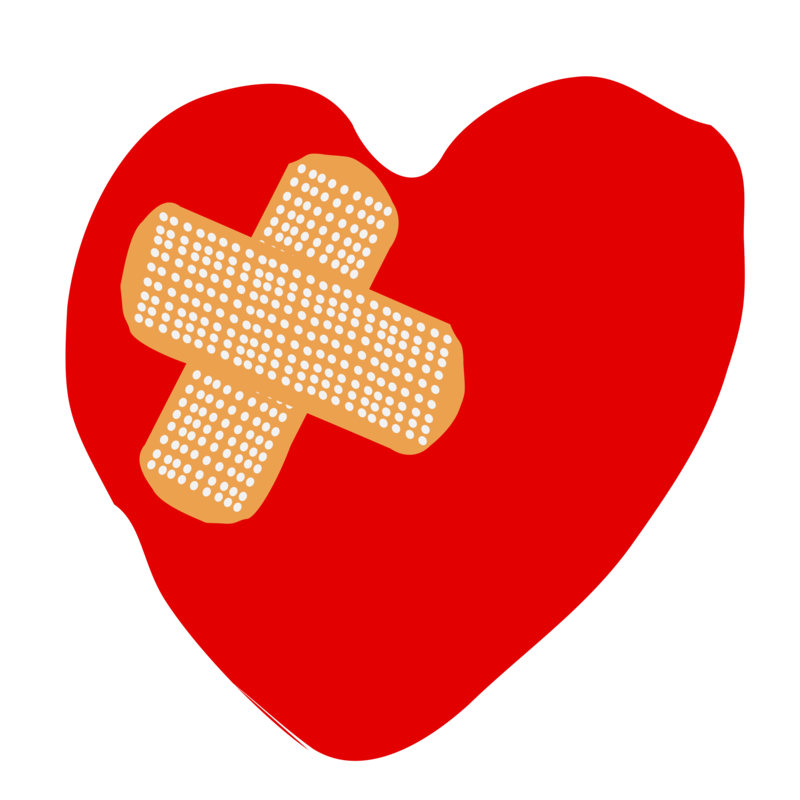 The Kubios user’s guide includes not only instruction on the software but also general information about the underpinnings of the various HRV indices. Physionet software. Another option for free, open-source software comes in the form of a HRV Toolkit from the Division of Interdisciplinary Medicine and Biotechnology at Beth Israel Hospital/Harvard Medical School. These tools do not have a graphical user interface like Kubios, but do allow for calculation of many of the relevant HRV indices and graphical representation of the results. HRV technology might well be most useful for dedicated amateur and elite endurance athletes who are looking for additional ways to monitor their training, make day-to-day adjustments to their training patterns, and avoid the negative adaptations of overreaching or overtraining. But from what we know from the rather limited studies of elite endurance athletes, HRV may not have the same, predictable relationships to a training cycle that have been observed in less-trained recreational athletes and non-athletes. In thinking about the hardware and software tools that are currently available, the Omegawave, Bioforce, and ithlete systems might be best suited for athletes who want to use HRV monitoring for the “short term” application I described above. A Kubios-based approach might be more suitable for athletes who want to use HRV monitoring during and through various training blocks. There seems to be a real opportunity for the heart rate manufacturers and the training data analysis/repository vendors (eg, TrainingPeaks) to offer some easy-to-use, mathematically transparent tools for everyday athletes. Realize that none of this is particularly simple, at least not yet. The serious endurance athlete who wants to make use of HRV monitoring might do well to use a Kubios-based approach to track some indices for a season and to simply gain familiarity with the process. In so doing, you’d become aware of how various HRV indices related specifically to each phase of your training. You’d become aware of both positive and negative trends in that regard. You’d then be in a position to see how best to make use of HRV in conjunction with other markers like fatigue, performance, resting heart rate, exercise heart rate, and heart rate recovery. There’s no doubt in my mind that the use of HRV technology will become more widespread in the endurance sports, particularly as we learn more about the real-world experiences of well-trained recreational athletes. Stay tuned. I’ll reprint the Endurance Corner columns here, in 2 parts…. In a previous column, I wrote about the resting heart rate and heart rate recovery and how they can be used as indicators for monitoring athletes’ training status. At least 2 other heart rate-related indicators are also used for that purpose. I’ll leave the discussion about exercise heart rate to Alan Couzens, our resident Endurance Corner physiologist, but I wanted today to introduce the concept of heart rate variability (HRV). In sports science circles, there has been a surge in interest recently in the use of HRV as a tool for monitoring athletes’ responses to training. The basic concepts have been around for decades, but technology—both software and hardware—is now becoming reasonably priced for individual athletes. The driving motivation has been a quest to identify physiologic markers that might help to optimize training and avoid overreaching or overtraining. In today’s column, Part 1 of a 2-part series, I thought I’d offer a primer on heart rate variability for those of you who might be interested in this emerging technology. In Part 2, I’ll cover HRV applications in the endurance sports and describe some of the software and hardware tools that are now available. Entire textbooks are written about the EKG, but let’s simplify things here. By convention, with each heart beat there is a p-wave that corresponds to the electrical activation of the upper chambers of the heart, the atria. Next, there is a Q-R-S complex that corresponds to the electrical activation of the pumping chambers of the heart, the ventricles. The cycle is then completed with a T wave that corresponds to electrical repolarization of the ventricles before the next heartbeat. This cycle repeats over and over again. Heart rate (beats per minute) = 60 / [R-R interval (in msec)/1000 ]. What’s interesting and relevant to our discussion here is that the R-R interval is not exactly constant. It varies from beat to beat, by a small amount. Said differently, the heart rate actually changes from beat to beat—thus the term heart rate variability. 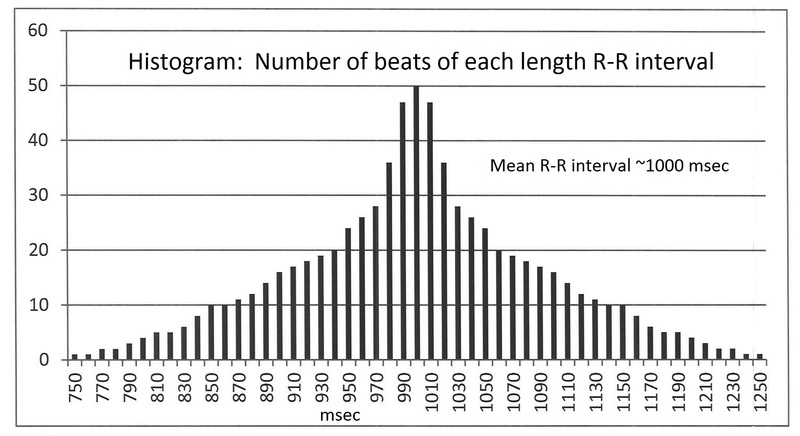 In the so-called time domain, quantities such as the mean heart rate and standard deviation (SD), pRR50 (the percentage of R-R intervals that are >50 msec different from the previous beat), or rMSSD (the root mean square of differences between successive R-R intervals—the average absolute value change in R-R interval between beats—can each be determined. We say generically that HRV is increased when pRR50 or rMSSD are increased. The area beneath the curve is referred to as the power spectral density, expressed in msec2. 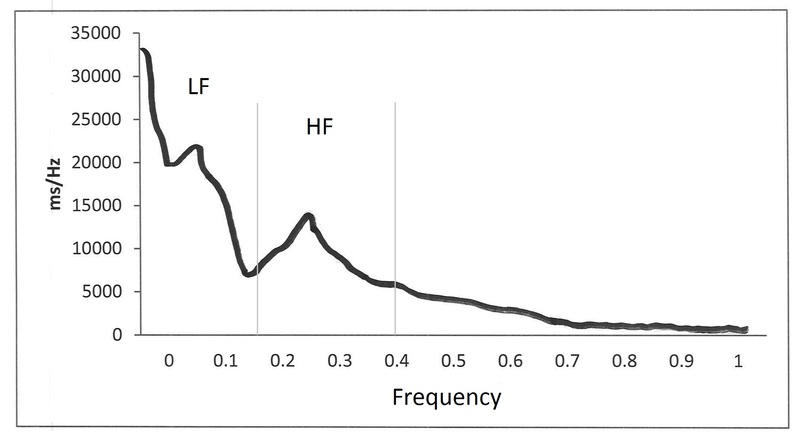 By convention, in humans there are ranges termed low frequency (LF, 0.04-0.15 Hz) and high frequency (HF, 0.15-0.4 Hz) for which power spectral density can be determined separately (again, the area beneath the corresponding portion of the curve). These values are called simply LF and HF. The ratio of LF to HF, or LF/HF is also a relevant derived quantity, as we’ll see below. Why is HRV Physiologically Relevant? The beat-to-beat variability of the human heart rate is governed, at least in part, by the autonomic, or involuntary nervous system, which has 2 components. The sympathetic nervous system acts on the heart to increase the heart rate and the parasympathetic nervous system acts on the heart to decrease the heart rate. In terms of HRV, HF is a reflection of the parasympathetic activity and LF is a reflection of the sympathetic activity. By extension, the LF/HF ratio is generally reflective of the balance between the parasympathetic and sympathetic activity. Despite the importance of the autonomic nervous system in clinical medicine, the use of HRV has found very few applications in the clinical setting. While HRV has been proposed for such purposes as early identification of infection, prediction of risk for developing arrhythmias, prediction of risk of death after heart attack, and risk stratification in patients with diabetes, among others, none has become a part of modern clinical practice because of practical difficulties with HRV measurements and poor correlations with important outcome measures. In Part 2, we’ll talk about applications of HRV to endurance athletes’ training specifically and I’ll share some information about the software and hardware tools that are available today.